I’m not sure that I can even call this a “recipe” since it’s really just a list of pre-packaged ingredients thrown together to make a “much more calorie friendly version” of something we all already know how to make. This is more just a “calories figured for you” documentation of what you can use to lighten up this comfort food! Editors note: Make this a “real” recipe by using my homemade marinara! 1. remove sausages from casing, and fry meat on medium heat, crumbling into peices as you go. Now’s a good time to add those optional ingredients like mushrooms or onions as well. 2. Drain excess grease from meat mixture. 4. Cook sauce on low in a covered pan, stirring occassionally. 5. Break pasta into manageable pieces and add to boiling water (with 1 tbsp salt if you like). 6. Cook pasta until it reaches your preferred texture. 7. Serve with sauce over drained pasta, in 4 equal parts. *Note: Prego SmartLight is the key here. this suace has about 1/2 the calories of any other pasta sauce i’ve found out there, and it tastes good too. 1. Add all ingredients except rice to crockpot, and cook on low 8 hours. 2. 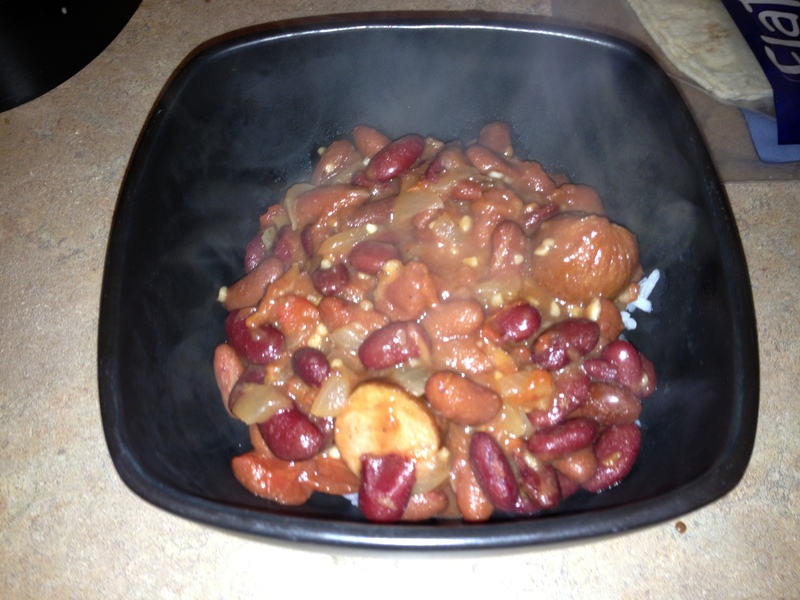 If beans are not “thick” remove from crockpot and cook in a pan on medium-high on the stove (no lid) until they thicken. 3. Cook rice separately, according to directions on package. 4. Serve Beans over rice. *** By 1/2 package of turkey sausage I mean this: They come in either 1 long, u shaped link, or 2 separate straighter links…. use 1 straight link, or cut the U shaped link in half. 100 lbs gone! My husband and I, together have reached a HUGE milestone! This entry will be short, and sweet…and to the (VERY EXCITING) point! Tonight, we are just 1 lb shy of the above referenced milestone, but I always weigh 2 lbs heavier at night, so I know that in the morning we will get there, and I wanted to share with you all. 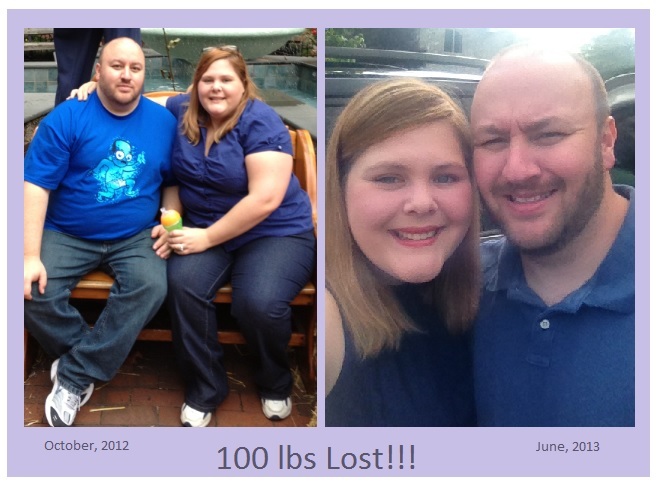 Combined, my husband and I have lost a total of 100 LBS!!!! We began our weightloss journey on January 6, 2013…and it took us about 6 months to lose the weight. We are far from done. In fact, we’d each consider ourselves about halfway to where we want to be…. but I’m so proud of how far we’ve come! Check us out!!!! If anyone’s interested in HOW we’re doing it. We’re losing a FREE app that counts calories for food and exercise, and budgets them for you daily. You track everything you eat, and your workouts…and it does the rest for you. It’s called “loseit” and we love it. We also apply lots of principles we learned on previous adventures with weight watchers….however, we decided this app does the same thing…for free. how can you go wrong? Check it out! 1. Preheat oven to 425, and spray a baking sheet with nonstick spray. 2. with a fork mix together laughing cow wedges and red peppers until blended. 4. brush the top of each chicken breast with Mayo, and then press the mayo side of the chicken into the breadcrumbs. 5. Place on baking sheet, coated side up, and spray top of chicken lightly with nonstick spray. 6. Bake until golden brown and done in the middle. About 25 minutes. **Variation: this works great with sundried tomatos too, instead of roasted red peppers. Yesterday, my family and I decided to take a nice hike while vacationing. 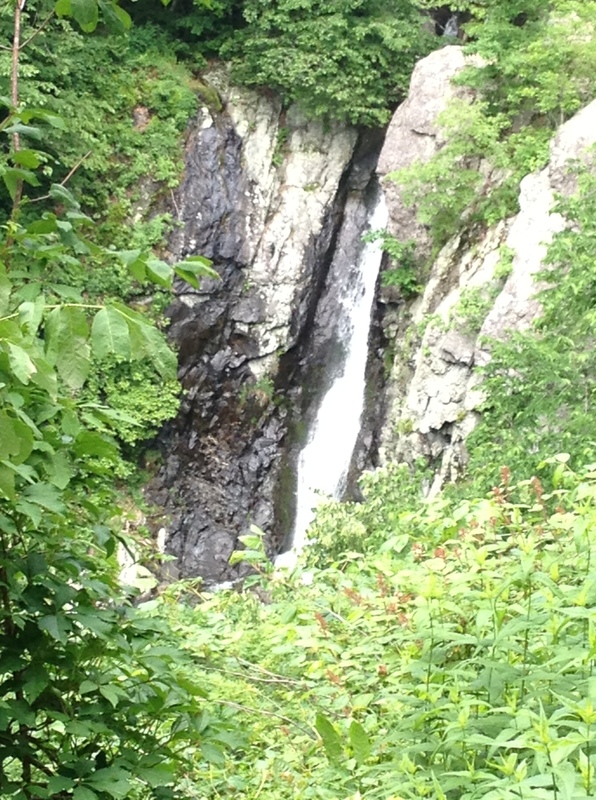 We headed out to the Shenandoah National Park near Elkton, VA, and chose a 2.6 mile path, which had a beautiful waterfall at the turnaround point. To paint the picture, there were 2 teenage boys, 3 9 year olds, and my 2 year old son in tow on this trip. Along with myself, my husband, my sister-in-law, and brother-in-law. There were little streams to cross, logs to get over, and other minor obstacles along the path, which was mostly down hill (on the way there) and seemed long, but not too difficult to maneuver, while holding the hand of/carrying a 2 year old along the way. We saw some pretty orange and black centipedes that scared the living daylights out of my 9 year old daughter, and, upon arriving, we saw a group of 5 rattlesnakes…which somehow scared her much less that the 4 inch centipedes. Go figure. Aggressive poisonous snakes vs. harmless colorful bug-creatures. The view was beautiful (see below). They call this the “South River” waterfall. So, if you’re ever wondering around Virginia looking for a decent hike and a pretty view… here ya go. In the end. I burned about 1200 calories in that 3 hour hike. AWESOME! Take a look at the beautiful view! 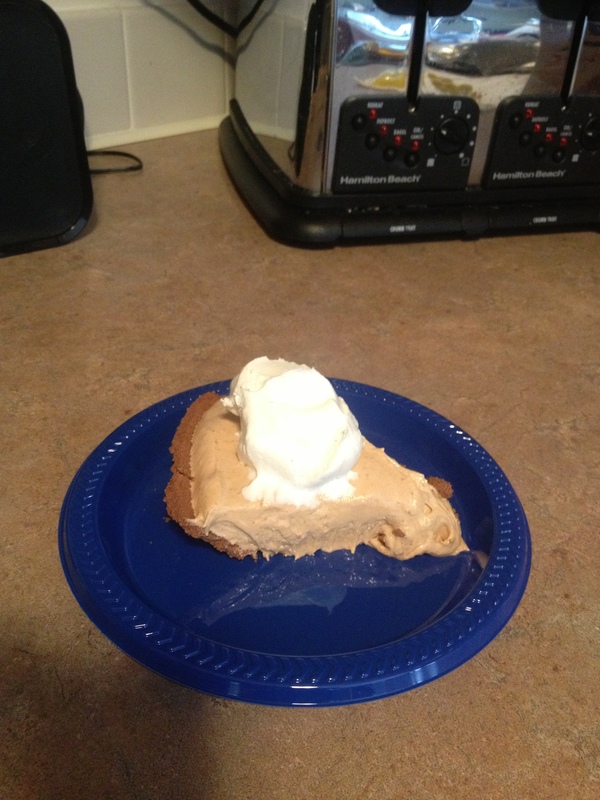 1. mix cream cheese and peanut butter. 3. gently fold in cool whip. 5. freeze for 2 hours. 6. serve frozen or thaw in refrigerator 1-2 hours before serving. Optional: Serve with remaining cool whip for garnish. 1. Lay out large piece of aluminum foil, then lay another piece on top of that. 2. spray the top piece of foil with nonstick spray. 3. Lay Cod fillet out on top of foil. 4. Season with salt and pepper. Spray with fat free butter spray. Squeeze juice of 3 lemon pieces on top of fish. 5. Lie the lemons you sweezed onto the foil, and flip the fish over so seasoned side Is on top of lemons. 6. Season the other side of the fish, just like the first side. 7. Fold/roll the sides of the foil up tight encasing fish into a tight fitting package. Grill on medium heat, 7 minutes per side. Fish is done when it’s white and flakey.